Today is the day! 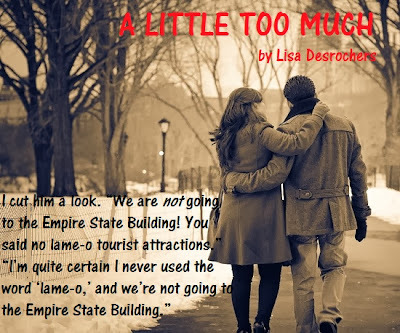 It's A LITTLE TOO MUCH release day! Get it on B&N, iTunes, or Amazon for only $2.99! I'm super excited that you all get to read about Alessandro...my poor, tormented ex almost-priest. I don't even have words for how much I love this guy, and that's saying something since I'm a writer. He is beautiful in so many ways. We first met him in A LITTLE TOO FAR, when he was sure of his path. He stumbled on that path when he met Lexie Banks. She made him question his choices, and in the end, if you've read A LITTLE TOO FAR, you know what he decided. So, now he's back in New York City. He has some ghosts from his past that have haunted him. One of those ghosts goes by the name of Hilary McIntyre. Alessandro stands again as I walk back to the table. He holds the back of my chair as I lower myself into it, then helps me slide it in. He sits again and looks at me for a long, awkward minute, swirling his coffee. “I’m sorry I was so awkward last night. You took me by surprise. I wasn’t planning to ring the buzzer, but I’d just found your address and I …” His eyes pinch a little and I realize it’s because I caught him there. He’s embarrassed. “How long have you been back in New York, anyway?” I ask, cutting him off. I don’t want to hear any more of his lame explanations. I just want to know what the hell he’s doing here—why he found me. If he knows. “About a month,” he answers, and my gaze is drawn back to his eyes. “To put some old ghosts to rest.” As he says this, his gaze darkens … becomes more intense, seeming to bore through me. “And you’re going to put me to rest,” I say, unable to curb the cynical edge to my voice. “The way things were left …” I repeat. The way things were left sucked. He has no idea how much. He's in for a bumpy road, because some ghosts aren't so easily put to rest. For all you A LITTLE TOO FAR readers, you know he has a dark past, so A LITTLE TOO MUCH is a darker read than ALTF. Alessandro and Hilary both are some of the most complex characters I've written, and at times they tore my heart out. But Alessandro also shows a side of himself we didn't get much of a chance to see in ALTF. His playful side makes him even hotter in my eyes. See if you agree!